Jenna is using her cell to learn about cells – the microscopic kind. As she browses the section of her schoolbook about cytoplasm, she can play an online game that her Broken Arrow science teachers hand-picked just for her and her classmates. If she’s not sure what a ribosome is, one click takes her to an entry in an online dictionary. The school district just completed a pilot program to replace its 5-pound traditional textbooks with streamlined electronic textbooks its teachers created with openly licensed instruction materials, called Open Educational Resources (OER). Rebecca Morales, science instructional specialist for Broken Arrow Public Schools, said the experiment came about after she attended a science consortium in August 2014, looking for ideas on how to implement Oklahoma’s new science standards. “All the science teachers in the state were pretty pessimistic about the textbook companies having time to align the conventional textbooks to our new standards,” she said. The district was due for new science textbooks, and she suggested teachers create their own, arguing that customized books would empower teachers to include lessons required by the new standards, rather than order deficient textbooks that might have to last another 6-10 years. In addition, if the textbooks were electronic, the district could update them annually. When Morales approached Lisa Sikes about creating a textbook for her sixth-grade class, the Oneta Ridge Middle School teacher was excited to give input but daunted by the amount of work required in a short amount of time. She and her colleagues had only four school days to complete the job. However, Sikes discovered she did not have to compose the material from scratch. Instead, the teachers spliced together openly licensed content from sources like the CK-12 Foundation, a nonprofit whose website is a repository of free teacher resources. Morales said CK-12 gets its information from subject-matter experts. “We’re using the same information; we are just leaving out what the textbook companies put in to accommodate many states,” Sikes said. Sarah Bailey, who teaches eighth-grade science at Oneta Ridge, was also on the team developing the district’s textbooks. She said the books were designed to complement classroom teaching rather than dictate it, a reflection of the shift to place more emphasis on projects and laboratory experiments than worksheets and solo reading assignments. “There is so much information in a textbook, and you have to train kids how to decipher it. Sometimes that’s really difficult,” Bailey said. For the first year of Broken Arrow’s OER textbook project, the district launched books covering nine subject areas: science for sixth through eighth grades, biology, physical science, military history, history of war, creative writing and principles of algebra. Teachers brainstormed the best order in which to present the material, then worked in teams of two to curate the information. Afterward, like true teachers, they graded each other’s work. Morales said the process was organic because the teachers work with students every day. Close examination of the standards led to a unique collaborative process that made teachers rethink their strategies. “They’re having a professional discussion based on the standards. They’re looking at the standards as evidence for why they think instructionally which information should go where,” Morales said. Broken Arrow also invited local experts and educators from across the state to contribute to the creative sessions. While teachers believe their customized textbooks provide time savings in the classroom, district officials are seeing significant cost savings as well. In 2015, Broken Arrow spent between $350,000 and $400,000 on science textbooks for its 10th, 11th and 12th grades. Meanwhile, the cost to print science textbooks for its sixth, seventh and eighth grades was only $30,000. Supplying textbooks to Broken Arrow’s ninth-graders was even cheaper. 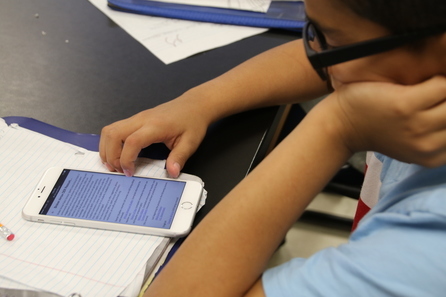 When teachers at Broken Arrow’s Freshman Academy heard about the plan to develop OER textbooks for the middle schools, they wanted in, but since the district provides each freshman with a Chromebook, administrators chose to keep the books digital only. By not printing those textbooks, the only cost to create a subject-area book was $2,000 to hire substitute teachers while the writing teams were compiling and researching. It will cost less than $1,000 to update the book this year for the entire freshman class. Broken Arrow’s OER experiment comes just in time. Drastic reductions to budgets have eliminated the $33 million state textbook fund for 2016-2017. The funding crisis has even spurred a number of textbook vendors to pull out of the state. Districts will need to tap their general operating funds or bond issue revenues if they wish to buy new textbooks this year, when the new Oklahoma Academic Standards for English Language Arts and Mathematics are being implemented. Public school districts in Oklahoma receive about $55 per student in a typical year through the state textbook fund, but that doesn’t come close to covering the price of standard textbooks, which range from about $100 to $200 each. Broken Arrow’s price to print its middle school textbooks was $6 to $12 each. Administrators contend that money saved was not the primary consideration in creating the OER textbooks. “We would not do this if it were only a cost savings. If we weren’t convinced that we were producing a superior product for student learning than what we could purchase, we wouldn’t do it,” said Mark Officer, director of secondary instruction for Broken Arrow. Broken Arrow believes its changing curriculum is on the right track because the books are living documents with which students can interact. “English language learners have electronic copies that are theirs, and they use the Google Read and Write app to have the books read to them. It highlights the text as they go. The kids can pick the reading speed, and they can even pick the accent and the gender of the voice speaking to them. It really personalizes the learning, which is what I love about it,” Morales said. In a survey of 1,500 students, the response to the OER textbooks was overwhelmingly positive. “It gives me more detail because the links take us to websites that help explain it,” said Harrison Kennedy, a sixth-grader who liked learning about scientific processes best even though his friends argued a skateboard game explaining friction was the best experience of the year. Bailey said her kids are making more connections and engaging in higher-level thinking than they did before. Every year, she challenges her students to examine Newton’s second law of motion to create catapults. “This year, I had students do the simulation that’s in our OER textbooks, and our catapults were by far better caliber, and in their lab reports they definitely understood the relationship of the mass and force ratio. Before, we were just launching projectiles,” Bailey said. The electronic volumes are proving not only relevant to students growing up in the technology age, but specifically relevant to them as Oklahomans. Teachers have inserted local interests in the books, such as zebra mussels native to Oklahoma lakes as an example of an invasive species. “The teachers really liked how they can make it be Oklahoma-specific. You can have these textbooks that talk about far-away places, which is great, but a lot of kids say, ‘That’s there; that’s not here.’ We’re trying to emphasize that science is around us everywhere,” said Morales, who lamented that books had already gone to print before the I-35 rock slide happened last summer. She promised it would be in next year’s edition. 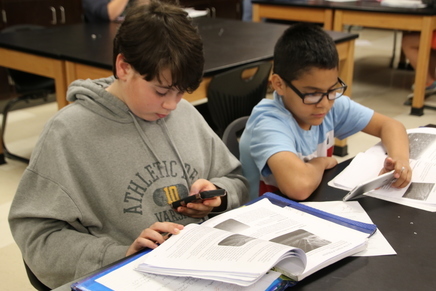 In Sikes’s class, where 60 percent of the students have cell phones, the sixth-graders watched an OETA news clip on Picher, the virtual ghost town in northeast Oklahoma declared a Superfund hazardous waste site in 1983. It has inspired some students to create a mock newscast on the dangers of pollution. But not everything in the classroom is high-tech. Jenna chose a more traditional medium for her final: a diorama illustrating the importance of clean air. Bailey notes that other benefits of the OER textbooks are old-school too, like highlighting, doodling diagrams and making notes in the margins. “That is really great for some of my struggling students, and it’s also really great for some of my super academic kids whose thoughts are going 90 miles per hour and they can jot stuff down in the margins,” said Bailey, who is excited that every one of her students gets to keep his or her book at the end of the year. Following Broken Arrow’s lead, Oklahoma is set to be one of the leaders in the country for Open Educational Resources. 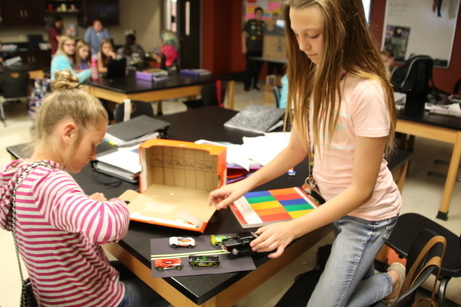 In February, the Oklahoma State Department of Education (OSDE) announced the launch of the #GoOpen initiative, joining the inaugural cohort of states committing to support school districts and educators who wish to incorporate OERs into their classrooms. Oklahoma is one of 14 states that have committed to create and maintain a repository of openly licensed resources and collaborate with other #GoOpen states to share learning and professional development resources. Of particular interest is the effort to ensure that Oklahoma’s OER material is accurate and reflects state standards, said Robyn Miller, deputy superintendent for educator effectiveness and policy research at the OSDE. “As part of the #GoOpen initiative, we are encouraging districts to explore OERs and making connections with districts that are compiling free resources. We’re concerned about quality, evidence-based materials that align with Oklahoma’s standards, and we’re using a cautionary approach to establishing a vetting process to ensure that these resources are a solid foundation for our children,” Miller said. Broken Arrow is the first Oklahoma district to pledge to #GoOpen. It plans on expanding its textbook library each year and is debuting books covering Oklahoma history and U.S. government this fall. It is offering electronic versions of its textbooks at no cost to other districts. Districts can either use the books as is or make alterations to suit their curriculum needs. Annette Price is communications and constituent services specialist for the Oklahoma State Department of Education. Oneta Ridge Middle School sixth-grader Francisco Carrizales reads his science textbook in class. Many students use their cell phones to access their textbooks via the Broken Arrow Public Schools website. Oneta Ridge Middle School science teacher Lisa Sikes helps sixth-graders Aaron Cook and Hunter Stidham access a video link embedded in their electronic textbook. 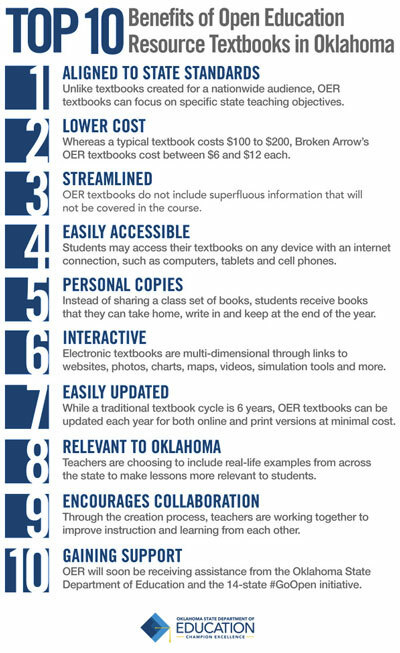 Broken Arrow uses Open Educational Resources to create textbooks aligned to Oklahoma’s academic standards. The textbooks can be accessed through the district’s website. Oneta Ridge Middle School sixth-graders Keegan Edgett and Francisco Carrizales can read their science textbooks in print or electronically. Many of the students use their cell phones to access their textbooks via the Broken Arrow Public Schools website. 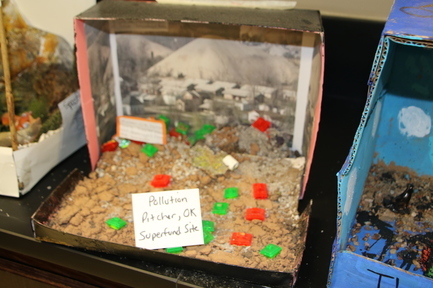 Oneta Ridge Middle School sixth-graders Chloe Ziegler and Jenna Haas create a diorama illustrating the importance of clean air after studying about hazardous waste sites such as the one at Picher, Oklahoma. Broken Arrow’s OER textbooks contain Oklahoma-specific examples to help children understand that science is all around them. When sixth-grade students at Broken Arrow Public Schools study pollution in science, their customized textbooks include information on the Superfund hazardous waste site in Picher, Oklahoma. The district’s customized textbooks include many Oklahoma examples that students can later illustrate in projects, such as this diorama.